There’s a Chicago Dog in my Pizza! The other night I made pizza dough in preparation for dinner. When it came time to make the meal, one of us wanted pizza and the other wanted hot dogs instead. David suggested hot dogs on the pizza. I thought to myself, what? Hot dogs on a pizza?! 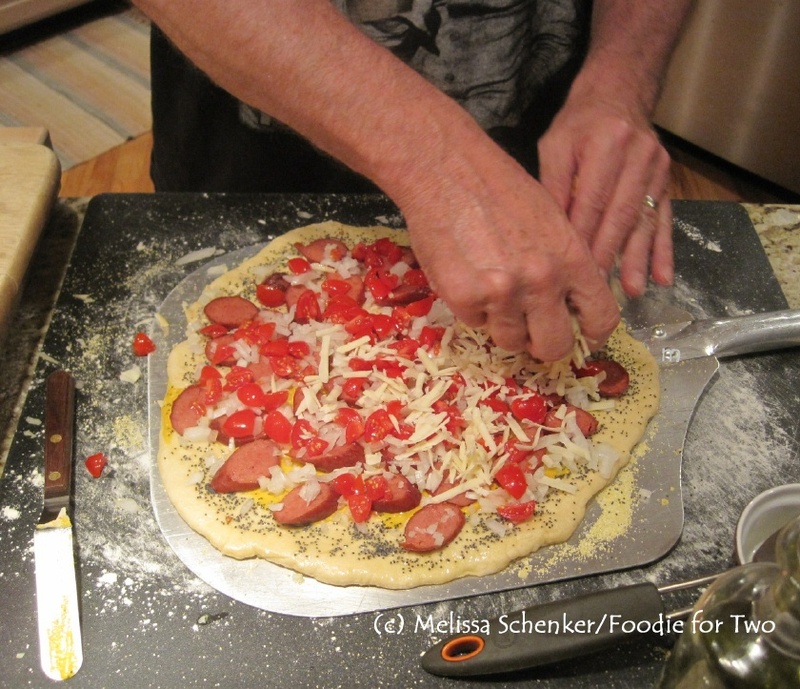 He continued with “how about a Chicago Dog pizza?” knowing how much I love a Chicago-style hot dog, and said “think about it, put all the toppings and the hot dog on the dough and we have a new idea for a pizza”. Hmm, it did sound quite creative so I decided to give it a shot. I have to say, we both were pleasantly surprised (David is quite proud of idea now). It was really delicious, with all the flavor elements that you would find in the real thing! Here’s how we pulled this off: Put your pizza stone in the oven and crank the temperature up to 500 degrees F, you want it nice and hot. Pick up some store-bought pizza dough, or buy a medium ball of dough from your local pizza place/restaurant, or make your own and roll it out. For a real Chicago-style hot dog, you must have a poppy seed roll. 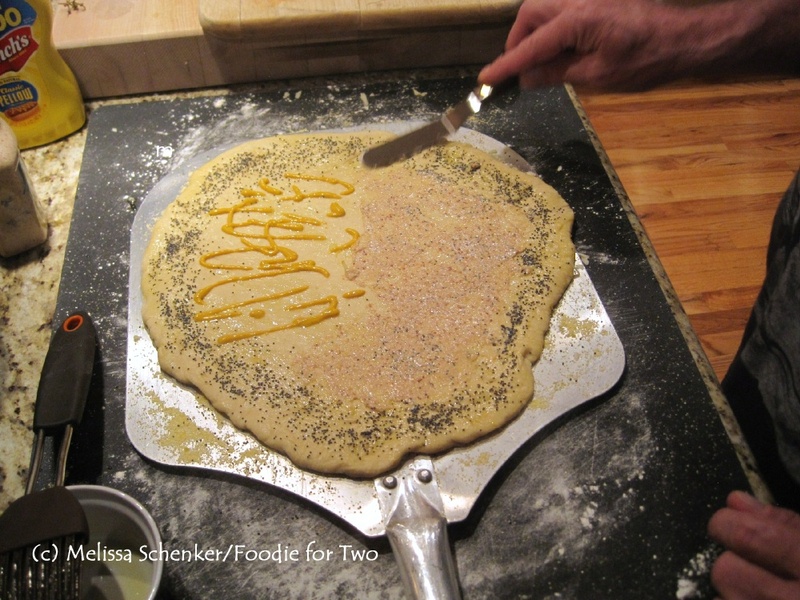 We brushed the dough edge with olive oil and sprinkled some poppy seeds on. Then it was a layer of mustard, one half stone-ground and the other half yellow. 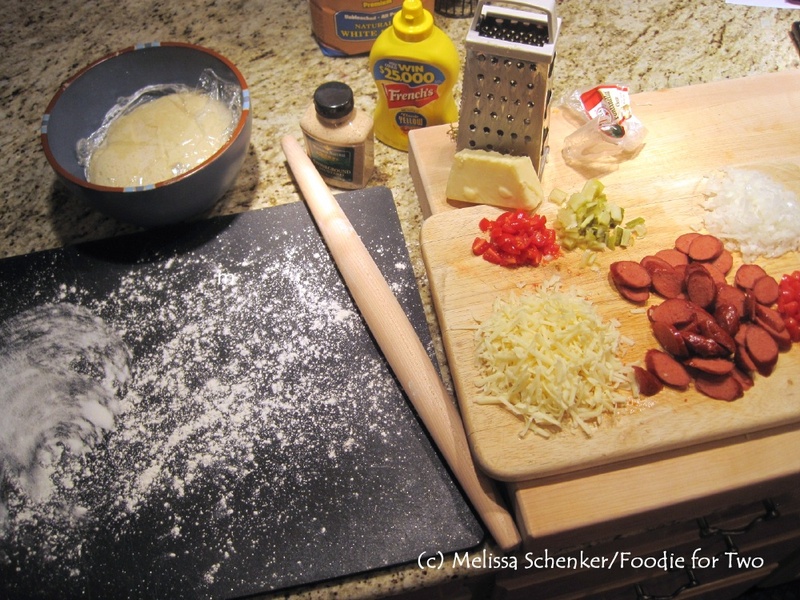 Next, slices of cooked all-beef hot dogs, some diced onions, diced tomatoes and a topping of grated Fontina cheese. After being cooked until golden brown and bubbly, chopped pickles, chopped sweet cherry peppers and sweet banana wax peppers finished it off. If you don’t have a pizza peel (a flat paddle made of either wood or stainless steel; I prefer the latter) you can use the back of a clean sheet pan. To keep the dough from sticking to the pizza peel, I found that cornmeal works best for me; they are like little edible ball bearings between the dough and the peel that help the dough slide off. And be sure to shake the pizza peel back and forth a few times during assembly so the dough doesn’t stick to it. No pizza stone? Just use a sheet pan with parchment paper and you are good to go. Either for a weeknight or weekend meal, this pizza is a fun twist on the classic. 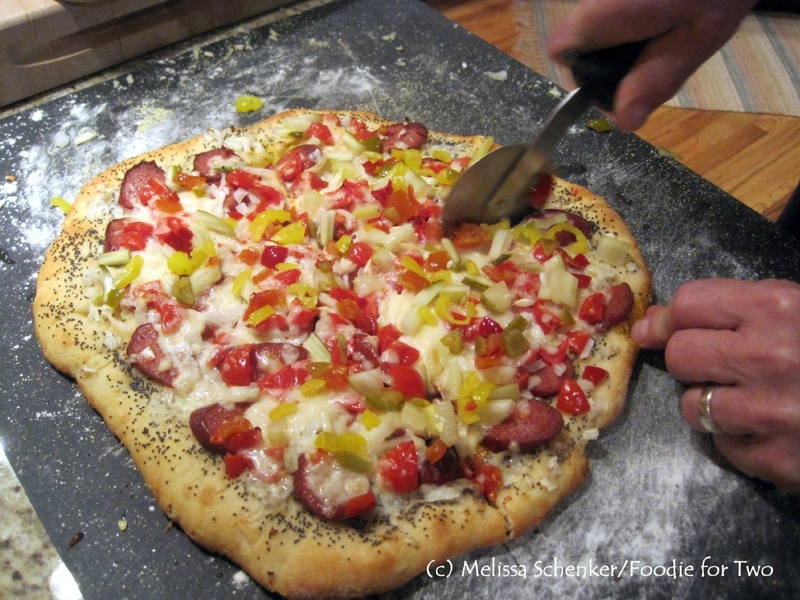 Place the pizza stone in the oven and turn the temperature to 500 degrees F. When the oven reaches temperature, roll out the pizza dough on a floured surface – about 12 inches round. Lightly sprinkle a handful of cornmeal on the pizza peel (or the back of a clean sheet pan), making sure you have a good coating in the front and the sides. Place the dough on the pizza peel. 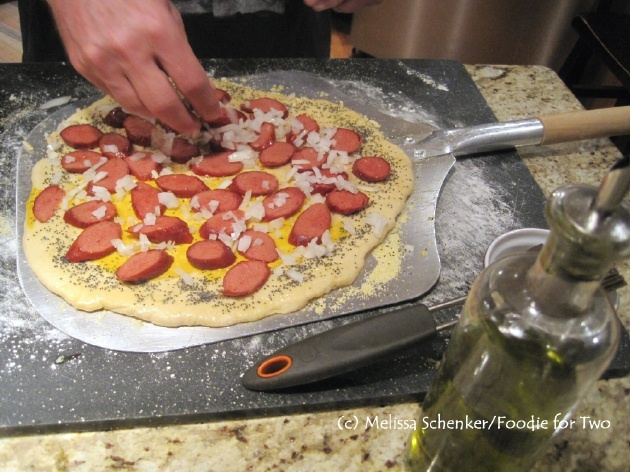 Brush one inch of the outer perimeter of the dough with a light coating of olive oil. Sprinkle the poppy seeds evenly around the edge. Spread the mustard on the dough and then gently shake the pizza peel back and forth to keep the dough from sticking. Lay the hot dog slices around, then the onions and tomatoes; lightly shake the peel again. Top with the grated cheese and transfer to the pizza stone in the oven. Cook for 8 to 10 minutes, until the cheese is bubbly and crust is golden brown. Turn the pizza 180 degrees halfway through cooking. Transfer to a cutting board and top with the pickles and peppers. Cut into slices, add some fresh cracked pepper, a few more poppy seeds and serve while hot. Cooking the hot dogs: When we buy the all-beef hot dogs at Costco, we freeze them in two-pack bundles – wrap the hot dogs in plastic wrap and store the bundles in a large bag in the freezer to make it easier for later. They can go straight from the freezer to the toaster oven (on foil-lined pan, remove plastic wrap) and cook at 325 degrees F for 10 to 15 minutes until they are hot with a nice crust. You can find the sweet cherry peppers and sweet banana wax peppers in a jar, usually in the olive aisle. Get Your Marmalade on for Dinner! I wanted my first blog to feature something that was easy to prepare and satisfying to eat – it was a difficult choice but pasta won out because it is an easy go-to for me. It can be prepared in so many tempting ways and comes in lots of fun shapes and sizes. I always feel like a successful foodie when I can make a simple sauce that’s full of flavor in the time it takes the water to boil and the pasta to cook. Mind you, I live at an elevation of 7,500 feet (2,290 m) so I am stuck with a little extra cooking time for pasta at this altitude. Mostly my recipe ideas work and sometimes they don’t – this one worked great the first time I made it. And even though the marmalade takes minutes to make it is full of rich, deep flavors. 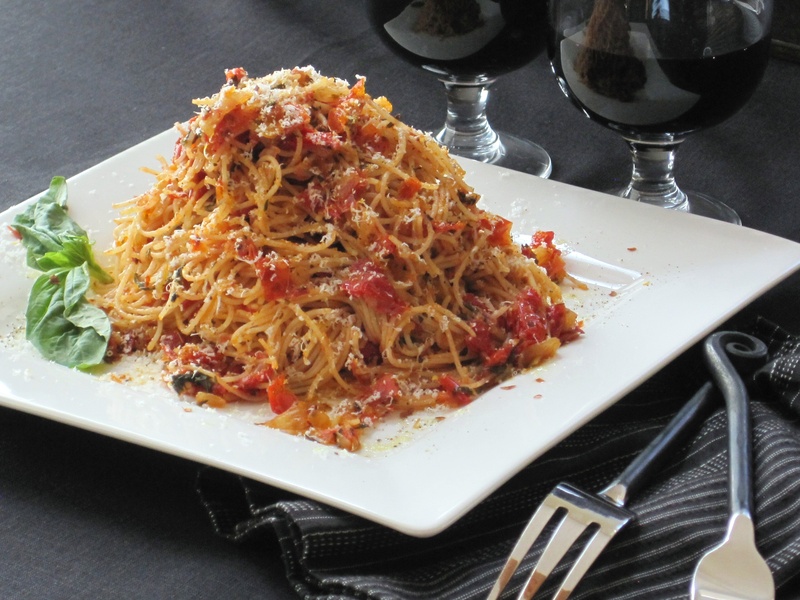 For this recipe, I recommend a combination of grape tomatoes (I am a big fan because they are packed with flavor) and Campari tomatoes on the vine. My inspiration for this recipe came from our trip to Italy and the Marche (pronounced mar-kay) region last October. Our host Paolo at Agriturismo Ramuse asked if we were hungry for lunch one afternoon and we excitedly said yes, knowing all the ingredients were fresh and local. It was one of the best meals I had during our trip – not to mention one of the best local Sangiovese wines I have ever tasted – because it was real food that connected us to his country and his land. 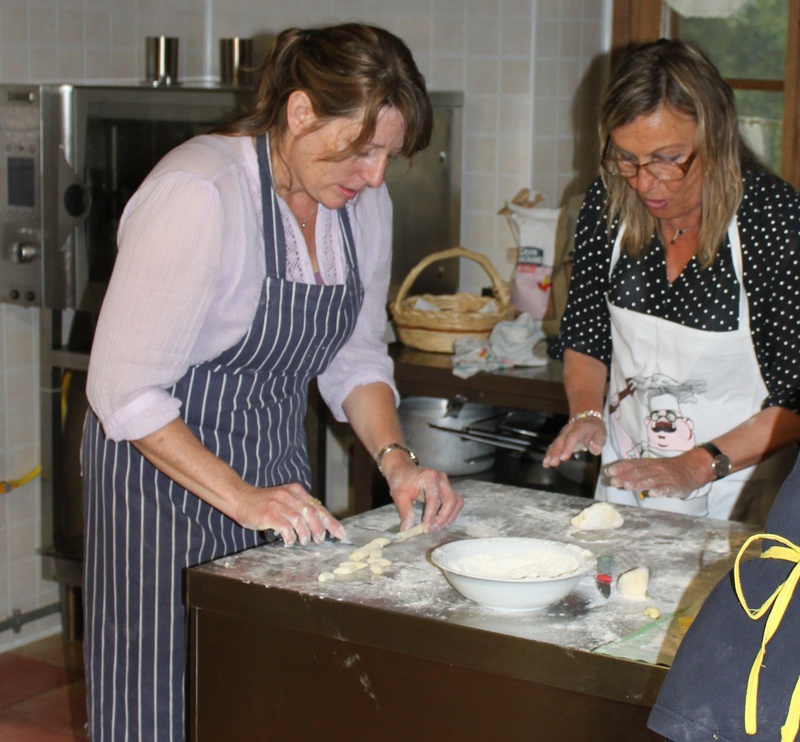 Melissa (L) and her new friend from Amsterdam, Netty, making gnocchi - a tasty blog for another time. During a cooking class in Paolo’s kitchen later that week , I noticed the amount of olive oil they used as the basis for a simple sauce. It was similar to how we use a few pours of chicken broth or stock to make a light sauce. I have since re-created the tomato sauce from Paolo’s lunch back in my own kitchen and thought it would be a great segue for a tomato and onion marmalade. The result was a satisfying meal made in less than thirty minutes. I was excited to recently find at Whole Foods pasta made in the Marche region, which I used for the photo (Montebello brand/Capellini style pasta). Angel Hair works just as well and is a tad thicker (try Barilla, in the blue box). Note: For those interested, the blue and white striped apron that I am wearing in the above photo belonged to Jamie Oliver and was given to Paolo when he cooked with him at Ramuse. Pretty cool, but too bad I couldn’t keep it. If you have the tomatoes, you can make extra Marmalade for another meal; just double the recipe and set aside one cup. Try using the marmalade on a crostini with ricotta (or just rub the toasted bread with garlic), as a condiment for your sandwich, over your favorite style eggs or on grilled chicken with some melted cheese over the top. Heat a tall pot of water to boil; add a drizzle of olive oil and a generous pinch of salt. Stir in pasta and cook al dente, about 4 minutes. While the water is heating, start the marmalade. Heat a medium skillet over medium-low heat and add 2 tablespoons of olive oil. When hot, add the onion, ¼ teaspoon salt, 1/8 teaspoon pepper, 1/8 teaspoon red pepper flakes, 1 teaspoon dried basil and ½ teaspoon thyme leaves; Sauté until tender, stirring often, about 7 minutes. Add garlic and let cook for about 30 seconds. 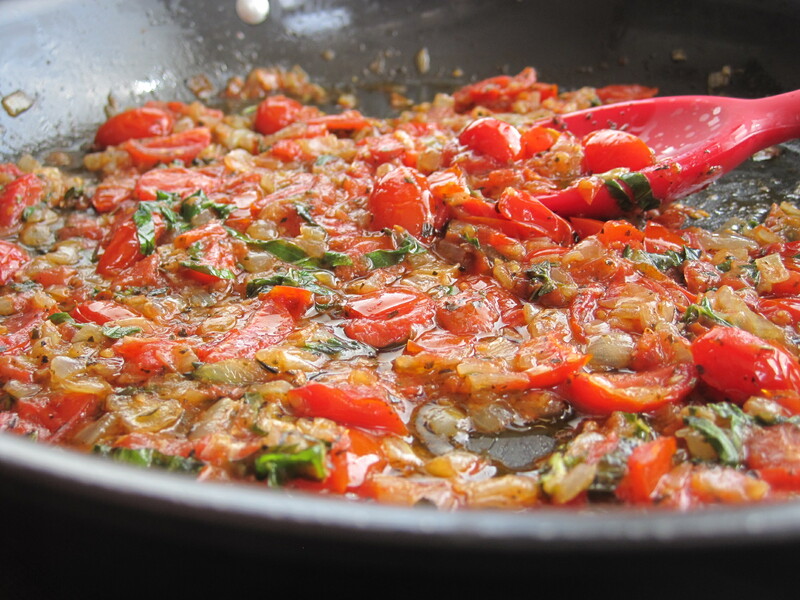 Add the diced tomatoes, a pinch of salt, 2 tablespoons olive oil, 1 tablespoon fresh basil and stir well. 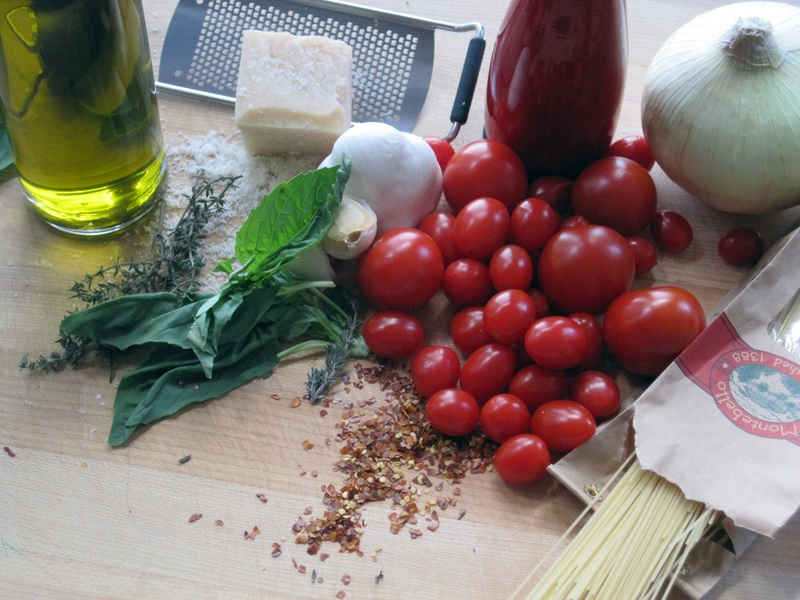 Let simmer over low heat while the pasta finishes cooking, stirring every few minutes. With a spaghetti fork or tongs, transfer the cooked pasta directly to the skillet along with a few ladles of pasta water and 2 tablespoons freshly grated Parmesan cheese; toss well to coat. Serve immediately and garnish with more Parmesan cheese and fresh cracked pepper. No need to chop the cherry tomatoes, just halve or quarter them depending on their size. To save time, Marmalade can be made one day ahead: While pasta is cooking, reheat on medium low heat and add a handful of cherry tomatoes to refresh it. If Marmalade batch is doubled: Refrigerate extra cup in air tight container for two to three days.